It had already been a long and grueling day. Saying our final good-byes to Dad in a drawn out morning of prayers and mass, supporting Mom among the many mourners and hosting the post-funeral luncheon. The long drive to the Catholic cemetery and the promise of being outdoors didn’t seem so bad. It was a beautiful Fall day, not something you’d expect in late November. The clouds were high and the sun poked through just enough to take the chilly edge off our shoulders. Not a drop of rain. We arrived at the cemetery, rested. We had had some much needed time to ourselves away from people and attention. When we stepped outside again I could sense a renewed energy and hope that the day was finally drawing to a close. For a nine year old, this kind of day can be excruciating. Having to follow the unfamiliar “stand up, sit down, bow, kneel, genuflect” of churchgoing is daunting. And to be patted on the head, hugged and touched by throngs of strangers, even more so. But the boy was a trooper and behaved well beyond his tender years. Perhaps because his mother had struck a deal with him. 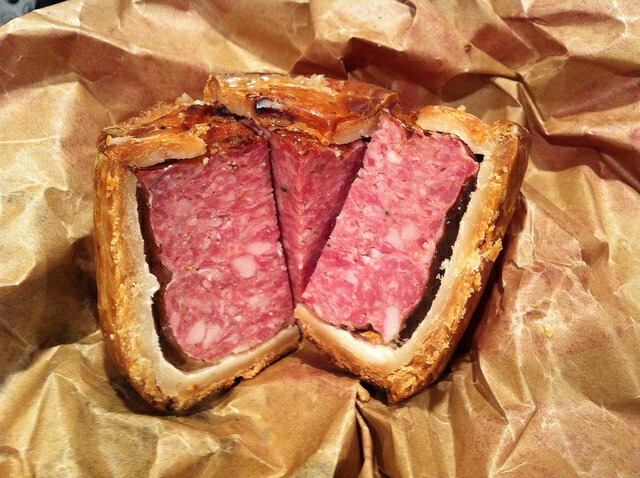 I had packed provisions for the day: water, fruit, crackers, cheese and the ultimate treat–melton mowbray pork pies. Our deal was that when our business at the cemetery was done, the boy would get to snack on a piece of coveted pork pie. So after Dad’s casket was lowered and we bowed three times in reverence, the boy gleefully ran off to retrieve his pork pie reward. The mourners began to drift away from the graveside when one of Dad’s closest church friends reined us in again for one final round of bows. I craned my neck and looked around for the boy. I waved and motioned for him to come back and he came scurrying just in time for the traditional three bows. First bow. Second bow. Third bow. And there stood the boy, clutching in each fist a massive chunk of pork pie. We couldn’t help but laugh and know that Dad was laughing with us. One piece of pork pie for him and one for the boy. All in great reverence.